Have you seen this photo on Facebook? 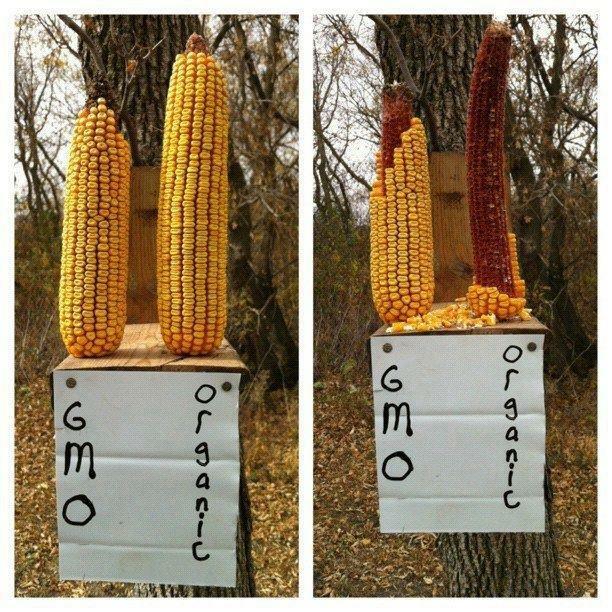 Proof that squirrels can detect the bad chemicals in GM corn? I’m usually more interested in the cat memes, but after the Senate failed to pass a bill requiring genetically modified food to be labeled as such, this issue began to interest me more. This article by Leonard Coldwell* describes the farmer’s story, which ‘proved’ that squirrels are able to sense that genetically modified (GM) food is toxic. In addition, Coldwell mentions multiple stories from “farmers” and “scientists” (without any citation) who reported that animals refused to eat GM food because they “naturally” know that it’s harmful. This is exactly the sort of thing that raises my skeptical hackles. Remember that anecdotes are one of the warning signs of pseudoscience. And this article and Facebook photo are nothing more than anecdotes generalized as facts. 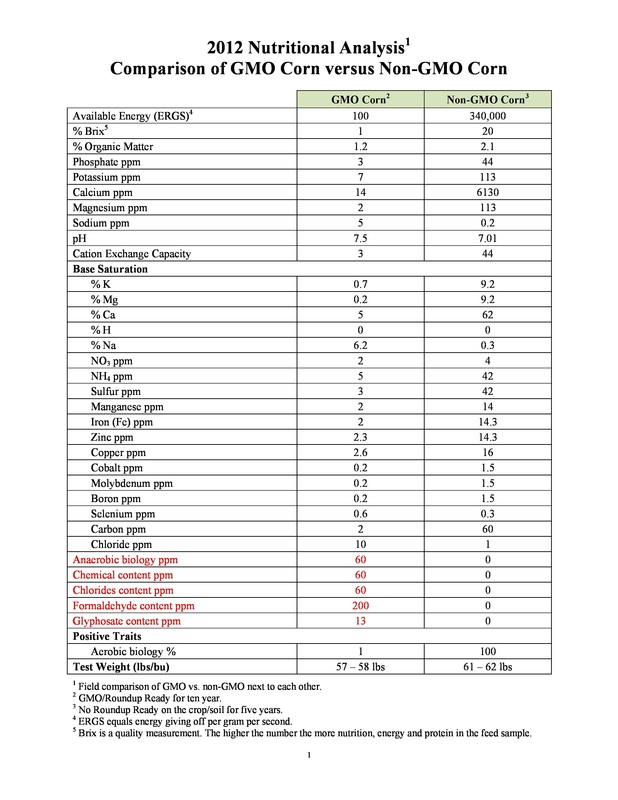 Graph purporting to compare the nutritional content of GMO and non-GMO food. Unfortunately for “Moms Across America,” it’s a fake. Despite its label, this table isn’t a comparison between types of corn at all: it’s actually soil data. When Dr. Kevin Folta (University of Florida) confronted her with this fact, Zen Honeycutt denied the evidence and banned all commenters who disagreed with her. Dr. Folta offered to finance a re-analysis of the corn by independent testing facilities, but this offer was rejected. I wouldn’t put much stock in this meme, therefore, or in the claim that animals can ‘sense’ the bad chemicals in GM food, until its proponents agree to allow this independent test to occur. Which they seem to be afraid to do. A few kooks aside, this is a question that actually concerns people. Is there any validity to health concerns regarding GM food? I decided to look into the scientific literature to see if I could get a straightforward answer to this question. There is one major study cited by anti-GM activists which claims to show that rats who ate Roundup-resistant GM corn developed tumors. However, there have been widespread and significant criticisms of this study’s design by the scientific community (here is an excellent write up). (The follow up story, consisting of very weird accusations of conspiracy leveled at the critical scientists and journalists is also very interesting). In fact, a review of all published studies examining the effect of genetically modified food on animals has shown that “GM plants are nutritionally equivalent to their non-GM counterparts and can be safely used in food and feed” with no adverse effects on animals. My general attitude is “the more information the better”, and when it comes to large corporations like Monsanto, I tend to be in favor of greater regulation. So I’m not completely opposed to labeling GM food. However, as I showed above and as the American Association for the Advancement of Science notes, there is a lot of wrong and misleading information being disseminated, and labeling food may have the effect of unnecessarily scaring consumers. Dr. Kevin Folta makes a reasonable argument against labeling as well. I believe that this is a reasonable discussion to have, so long as false claims about GMO dangers to health aren’t the focus of it. One additional concern that I have regarding labeling GMOs is based on issues of class and privilege. Many people (myself included) can’t afford to eat an exclusively organic diet. So how useful will such labels be for us? Will they serve as an additional distinction between rich and poor, and as a source of criticism, especially of parents who feed their children a diet of GM food? The scientific consensus right now is that GM foods aren’t dangerous to human or animal health. Your current criticisms of GMOs are mostly based on appeals to nature. You need to make your case better. I am not unsympathetic to your concerns, and believe that they’re well intentioned. But misrepresenting the science on the effects of GMOs on health, and passing around images designed to frighten people is manipulation. Instead of doing that, why not take the high road and conduct and publish high-quality, peer-reviewed research? There’s no grand conspiracy among the scientific community to suppress these results; you simply aren’t producing them. If you provide sufficient evidence that shows GM food is harmful to human health, then I and other scientists will accept it. However, if your position can’t be supported by scientific evidence, then you’re wrong and no vague statements about this technology being “unnatural” will convince me otherwise. **I intend do do a separate post on the effects of GMOs on the environment, looking at issues like sustainability, crop resistance and how the seed industry exploits farmers. I think that’s much less straightforward, so please stay tuned. Nicely done. Keep in mind that Joel Spiroux, President of CRIIGEN (Seralini’s institute) is a practitioner of homeopathy and acupuncture. To me the biggest tip off is Figure 3 in the 2012 Seralini paper. You know, three lumpy rats. What’s missing? Oh, the control rat, that table 2 will tell you also gets cancer. They somehow forgot to show that one. Their numbers are too small to make any kind of statistical argument, so they can’t claim frequency. Still, they should have included it in Figure 3. That says they are either sloppy or trying to deceive, or both. Thank you. Very good point. Yes, the Seralini paper’s glaring flaw is not mentioning the fact that the controls ALSO got tumors…because the strain of rats used was bred to have a high rate of cancer. Extremely sloppy….or agenda-driven. Either way, the reviewers should have caught this. 60 years ago there were advertisements stating that “more doctors smoke Camel cigarettes” to make the public think it was safe. Studies showing how unhealthy cigarette smoking was didn’t come out for decades. Hmmm, something to ponder. Actually there were the studies showing a clear connection to tobacco that came out right after WWII, over sixty years ago (see the book The Emperor of All Maladies). The tobacco companies tried to counter the science with propaganda (see the book Merchants of Doubt: How a Handful of Scientists Obscured the Truth on Issues from Tobacco Smoke to Global Warming). Before making statements on what “to ponder”, try actually learning the history of the subject.